Joshua Conyers is sitting astride a singing career that is poised for takeoff. And the 30-year-old UNC School of the Arts grad is giving it all he’s got. Since August, Conyers has been a member of the Washington National Opera’s Domingo-Cafritz Young Artist Program, a program of the John F. Kennedy Center for the Performing Arts. That means he is learning lots of roles in the space of his 10-month residency, understudying lead roles for Washington National Opera productions and performing secondary ones. 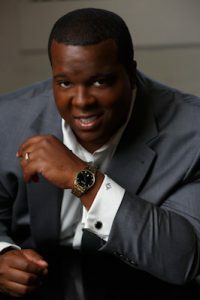 In the midst of all that, Conyers is bringing his baritone voice, which has been described as “deliciously honeyed,” to Wilmington February 22 to perform as part of Opera Wilmington’s “Exploring Opera and Beyond” symposium. His concert program features a range of selections, from arias to gospel. Earlier in the day, Conyers will conduct a master class open to undergraduate singers of color. That event is open to the public at no charge. This is Conyers’ second time on a Wilmington stage. In the summer of 2015, he earned raves as Rigoletto, a crippled court jester whose life is shattered, in Opera Wilmington’s production of Giuseppe Verdi’s opera of the same name. What do you do as a young artist? We cover big roles and sing smaller roles. The goal is to sing for – in front of – as many agents and directors as possible, in order to get professional opportunities and make a full-time living. I’ve been fortunate; this is my second young artist experience. For the past two years, I’ve been a young artist with the Palm Beach Opera. What’s next after your current program ends in May? I will spend my second summer at Wolf Trap, singing the role of Porgy [in George Gershwin’s Porgy and Bess: A Symphonic Picture], Ramiro in Maurice Ravel’s L’heure espagnole, and Musiklehre in Richard Strauss’ Ariadne auf Naxos. What would your dream path be? Hopefully, in the next few years, I will get more Verdi and Puccini roles. Verdi [wrote roles] for older baritones: fatherly figures. I’m setting myself up for those, taking my time. I’m preparing for a lot of roles of “heavier repertoire.” I see myself singing all over the world. You’ve already distinguished yourself in competitions, right? Yes. I just won the district Met [District Council] Audition in New Orleans. It’s the fifth time I have won district auditions: three in North Carolina, one in Indiana, and this last one in New Orleans. You did your undergraduate work at UNC School of the Arts. Are you from North Carolina? No, I’m from the Bronx, and then moved to Virginia as a middle schooler. I attended the Governor’s School of the Arts in Norfolk and was singing opera at 15 – I hated it at first. I was part of the Star Program at Virginia Opera in high school. We’d travel to [perform in] shows. My mom was really blown away by it; my dad was usually snoring. Teachers from the UNC School of the Arts would come give master classes. I got a scholarship there. I earned my M.A. at Indiana University. Home is where my wife is, and that’s the way it will be for the next 20 years or so. We have just moved to Boston, where she recently became director of admission for the Boston University School of Music. We’ve been married five years. The biggest challenge for me is being away from home a lot, away from my wife and our two lovely dogs. Music has been important to you most of your life, hasn’t it? I’ve kind of hedged all my bets on music. I grew up in the New York City shelter system from the age of four until I was ten. They finally put us up in Jamaica, Queens where we could pay the rent. Then my older brother and I went to Virginia to live with our grandmother. Later, our parents joined us and we were in the shelter system there until we got a home in Chesapeake, Virginia. I wanted to sing. It was my way out; my outlet, after growing up around alcohol and drugs. Singing was the way I could keep it all together. I dedicated everything I had to it. I had no Plan B. Being an opera singer: you have to love it. This career has to be about more than a steady paycheck. You have to give your heart and soul. Is it a challenge, being African American in the world of opera? It can be difficult. You don’t see a lot of people who look like you in this business. That needs to change. We need more representation; we need more [organizations] like Opera Wilmington. It’s all about access people have to the music. Access to opera is not getting to the African American community and welcoming [singers] into the fold. There are not a lot of African American people in power in opera, including in management.